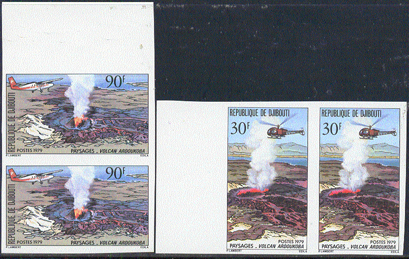 44551 ND DJIBOUTI (1979) Helicopter*, plane* circling volcano*. Set of 2 imperforate pairs. Scott Nos 491-2, Yvert Nos 497-8. 45290 ND FRENCH POLYNESIA (1993) Volcanism Symposium*. Imperforate. Scott No 622, Yvert No 438. 29643 SPE JAPAN (1972) Kendo*. Volcano*. 27th National Athletic Meet, overprinted MIHON (specimen). Kendo is a form of fencing. Sakurajima volcano in background. Scott No 1129, Yvert No 1068. Nice!